Elizabeth Chalker has written a powerful, God inspired book that will encourage and help strengthen anyone who reads it. If you are in the midst of suffering, or struggling through intense hardships, then this book will provide solace and hope to pull you out of the darkness and into the light! I don't know if there is really a way for anyone to understand the depths of pain and suffering from which this work of Elizabeth's springs. As one who has witnessed this firsthand, being physically with her in the day-to-day more than anyone else, it's still unfathomable to me what she goes through. The reality of her minute-to-minute existence is far too unbelievable to wrap the mind around. Most of the writing was done in a very dark, cold room in complete silence. Much was done with the computer on Elizabeth's lap, with her typing with her eyes closed, as the light even from the computer screen was too much, too painful. All of it was done with a continual headache/migraine, as those only change in level of severity. She worked in small increments in between excruciating, unbearable physical pain and exhaustion, and moments of reprieve where the physical pain/symptoms and migraines were "bearable enough." Most of us will never know the loneliness that she experiences or the fear as she watches uncontrollable things happen to her body each day. Even though I am with her as often as possible, and she is never out of my thoughts or my heart, most of this she suffers completely alone, except for her constant companion and angel of God, Symon. Yet in this existence, that is impossible to call a life, she has never wavered in her faith. She has sought, screamed, challenged, asked tough questions, and been candid in her queries, and also candid in all of what she experiences. However, she has never abandoned her faith. Additionally, she has always been there to support those she loves in spite of the constant abandonment, with words of faith, encouragement, love, and wisdom, always giving beyond her strength and capabilities and often paying a huge price of increased physical pain and other symptoms for days or weeks, as her own health deteriorates. To me, she is the epitome of what God wants for all of us. To love where there is no evidence, give when there's nothing left and believe where there is nothing left to hold onto except "the scratch marks our nails left behind." Elizabeth, you are and will always be a daughter, very dear friend, and mentor to me. I congratulate you on completing this amazing project, this work of raw faith. Your perseverance is astounding and awe-inspiring. To witness the tortures you live every second of every day, the loneliness, the travesty, and injustices, and then to see the incredible genuine love you are, is truly phenomenal. God shines through you so brilliantly, such is evident to all who know you and know of you—and is equally evident through the God-inspired writing you have completed and now share with the world. I love you forever. This God inspired book is sure to bless your life and strengthen you within on your own life's journey. Order your copy today and have your life inspired by hope and faith you never imagined possible! The proceeds from this book helps Elizabeth pay for her medical needs. 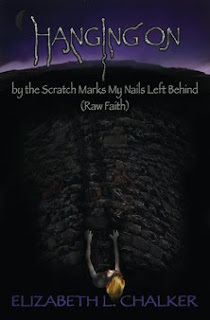 For more information about Elizabeth and her book visit Hanging On by the Scratch Marks My Nails Left Behind Raw Faith. For those who would like to get to know Elizabeth and read more about her life-story please visit Help Elizabeth.